We will be having our April Missions night on Wednesday, March 28th at 4:00 pm. We will have our Missions Meeting and Supper plus Jane Lowery has set up a guest speaker for this date. Christy Holshouser is a nurse and serves as an International Missionary. She has been to Shanghai as well as other locations. We look forward to learning more about her travels. The church will be having a Christmas Lunch Saturday, December 16th at noon. They will be providing turkey, ham or both. Please bring your favorite sides and desserts. The BBQ luncheon held here at Second Baptist on Sunday, October 22nd was a roaring success. Mary Frances, Ed Herring, Tina and Ed Hyman (Lucile Ferrell's family) brought all the BBQ, sides and drinks for lunch. Desserts were brought by other church members. It was a great time for fellowship and food. We greatly appreciate Mary, Frances, Tina and the Ed's for their gift to our church. Homecoming has come and gone.The Heritage Quartet was our musical guests. They put on quite a show. They put all their hearts and souls into giving the congregation something to remember. A meal was provided after the Service. Chicken was provided by the church and church members brought their favorite covered dish or dessert. It was a feast that all there couldn't help but enjoy. Much thanks to the Heritage Quartet and their crew and all those who provided the side dishes for the chicken. 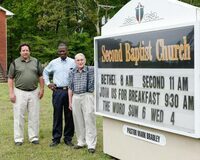 We had Sunrise Service at 7:00 am on April 16th followed by breakfast at the church. The outdoor Service was a simple service which everyone enjoyed as well, everyone enjoyed the breakfast. Regular Sunday School service was at 10:00 am and at 11:00 am was church service..
We were honored to attend Lucile Ferrell's Birthday Party! We had over a hundred people drop in. The bottom floor was so beautifully set up and the food was out of this world. Lucile, you are truly loved and we are so lucky to have you as part of our Church Family. Seeking to minister to everyone!